and Chip K9IOC "The Fox with great scents!" Thanks to Chip K9IOC (the fox) for another great NFW hunt! And to the faithful hunters within the KARS organization! G Where does the title "Hunt For The Lilacs" come from, you may ask? The fox, Chip K9IOC was parked in an area with old heavy brush. been the site of a home likely around the turn of the century. the scent of lilacs was very apparent from the moment I exited my vehicle. 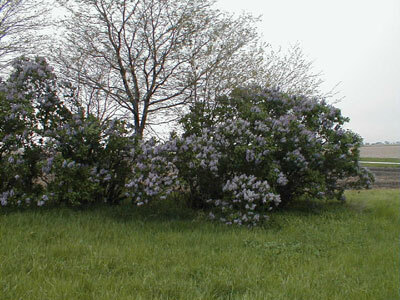 A mild breeze found us down wind of a large old group of lilac bushes. Words can't express how strong the scent was. Reminds me of home as a boy. My mom had a massive lilac hedge. 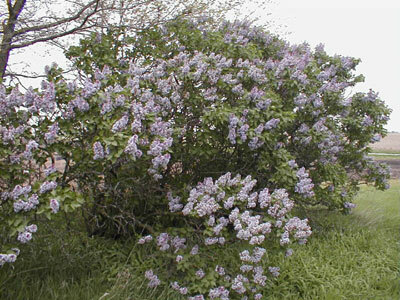 These old fashion lilacs are pictured below. We held our NFW weekend on May 1st. the Kentucky Derby's 130th Run For The Roses. KARS 2004 National Foxhunt Weekend. Hence, "Hunt For The Lilacs." to determine the winners of KARS sponsored fox hunts. young new membership, of which we have a few. Not to mention my own youthful offspring. You see, the fox in this case was our son Chip. our daughter Crystal W9IOU and her friend Anthony. Charlie WD9FIG and Midge WD9FIH, whom I am forever grateful! Chip was ten years old then, Crystal was only six weeks old. Our family was young, great memories were being made. we realize how exciting the hunt can get. the previously used methods in this type of hunt. the decision was made to change to "distance traveled." 2nd in mileage, N9IO / N9IOQ were 3rd. tenths of a mile. Crystal has been my hunting buddy for years. for making mistakes during a hunt. She really gets into it. Crystal is baby sister to Chip, "The Fox." In no way was she tipped off by her big brother. The rivalry is far too intense for that to have happened! This is only the second year she has been hunting on her own. Teaching the winning side of fox hunting. Way to go Crystal, Congratulations on your first big win! and decision you make each and every step of the way. The added safety margin increase is tremendous. The hunts are much more laid back and relaxed. only the mileage used to enter and leave the parking lot. Certainly a thought to entertain. 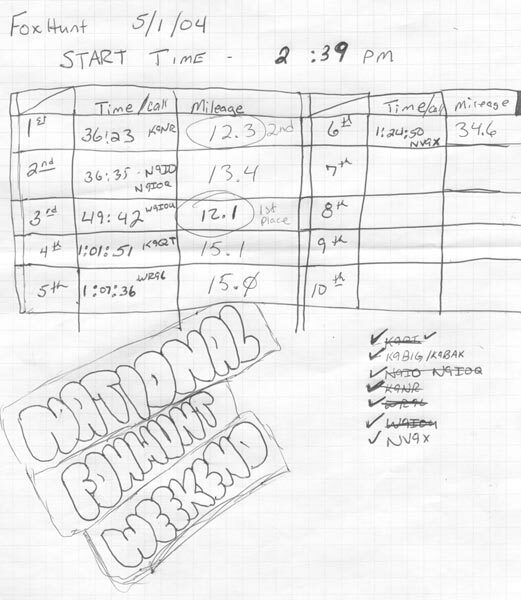 Give mileage hunting a try. Chip K9IOC, has a history of finding great fox holes, this one was certainly no exception. Parked in an area with old heavy brush. Near dense lilacs, Chip turned out to be "a fox with good scents." We think it possible, lilacs reflect RF, as opposed to the absorbing characteristics of normal dense foliage. Or, perhaps Chip was just throwing his voice? Chip was first licensed in 1985 at age 10. Same year of his first foxhunt. Way to go Chipmeister. Another great NFW hunt! 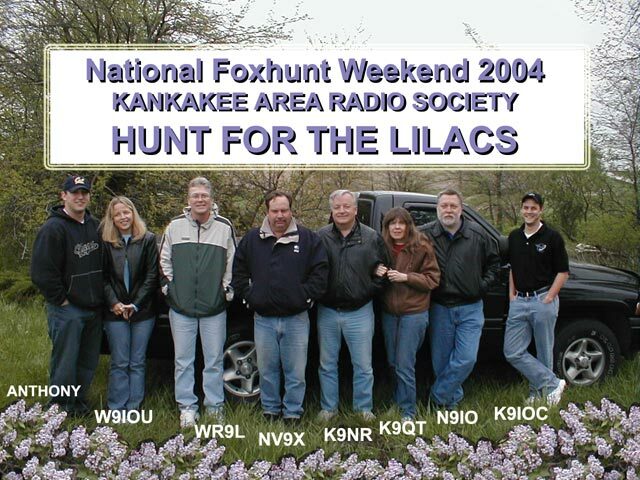 The 1st Place winning NFW 2004 hunt team of Crystal W9IOU along with her friend and very capable navigator / driver Anthony, displayed tremendous abilities in this "Hunt For The Lilacs." Crystal was first licensed in 1998 at age 12. 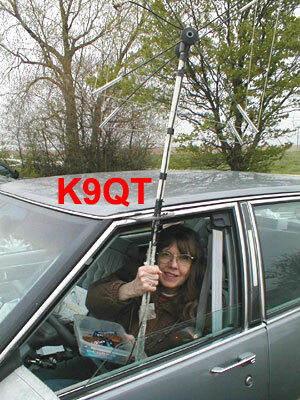 The 2 element quad antenna she is using, is the very same antenna used in the first hunt our family was ever entered in to. Crystal was only six weeks old, and yes we won that hunt. The quad has now been given to Crystal, and is her foxhunt antenna. Dad, (N9IO) has built a new identical quad for himself. Why fix what isn't broken? Crystal and Dad both use combination Passive / Active attenuators built in one unit. Home brewed of course. 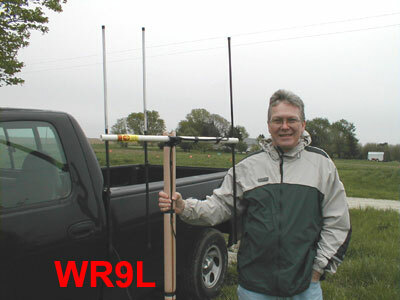 Greg WR9L prefers the yagi style of foxhunt antenna. Greg is someone you can generally always count on to be there when a hunt is called. This consistant dyed in the wool foxhunter is also an avid VHF / UHF contester, and maintains a 6 meter beacon on 50.071 mhz. Greg has been active in foxhunting many years, and is also KARS secretary. Greg has also introduced fox hunting along with HF operating at the local Boy Scout camp during the annual Jamboree On the Air (JOTA). 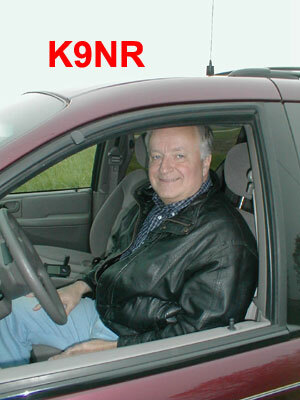 Don K9NR, OM to Billie K9QT is another yagi enthusiast. An avid HF contester / DXer, KARS VP and repeater committee has long been a pillar to the KARS organization. A KARS member since he was a teen. Excellent, consistant hunter. Don is another always ready for a hunt. Pictured with trusty quad antenna in one hand, and "foxhunt treats" in the other, Billie K9QT is one of KARS' staunchest supporters of the hunt. Always up for a hunt, Billie is usually the first to ask, "when's the next hunt!" Foxhunt treats have become the norm at our hunts because of Billie. She likes to bake. Guess you could say she is a "pusher of sugar," but it sure is good. Her foxhunt brownies are probably the most popular of all. And yes, foxhunt brownies are by far better than just plain old brownies! Billie is also the "KARS Key Klicks" newsletter editor. Thanks for all the support Billie. 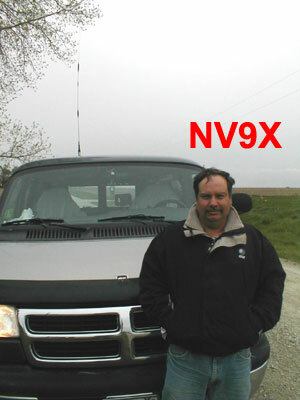 This Jim NV9X. Jim is a former resident of Kankakee County. Actually, he was a neighbor of mine nearly 20 years ago in Manteno Illinois. He now lives up north in all the congestion, but still keeps in touch. He is a member of Tri-Town ARC. This was Jim's first hunt. Fortunately for Jim, he knows the county, because he actually found the fox with the mobile antenna you see pictured on the van. Pulling the coaxial connector off, driving and comparing signal strengths and the like. It took him a little longer, but what an amazing job he did. 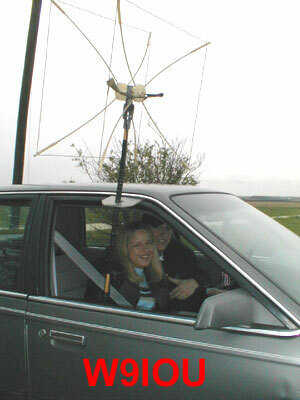 Jim has since picked up an arrow yagi antenna at Dayton and is hunting now in very short fashion like an old pro. We're sure happy that you took up foxhunting Jim. Hope to see you more often. Old Fashion Lilacs, found everywhere in Illinois. These just happened to be at this foxhunt's finish line, making the hunt just that much more enjoyable. You can almost smell them, so fragrant. 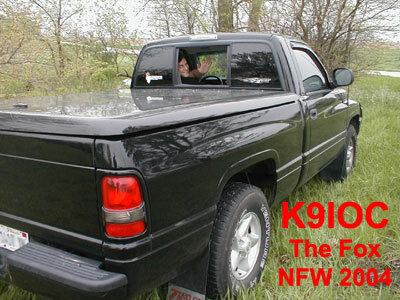 We hope you have enjoyed this page of the KARS 2004 NFW Weekend. I know we all certainly had a good hunt, and an even greater time socializing over dinner at El Campasino restaurant in Bradley. the KARS Hamfest is over on July 4th. come join in on the fun and excitement! Other clubs are also encouraged to join us. Reciprocal hunts would be fun!